You may have seen - and heard - them increasingly abuzz in the skies above you in open spaces. Drone-flying has become increasingly popular as a hobby here, with groups popping up on Facebook and online forums, where like-minded fliers gather for "flymeets". With prices coming down, the drones - or unmanned aerial vehicle - are drawing many new fans. Drone-flying has evolved. What used to be a toy is now a machine, and we should exercise personal responsibility when we fly. Small, entry-level drones, such as the Hubsan X4, sell for a little more than $100. Other starter drones include the Parrot AR Drone and the Skytech M63. Those who take the hobby a little more seriously may get the DJI Phantom 3 for about $2,000. A few years ago, a top-end drone with similar specs would have set one back about $4,000. Mr Derrick Tan, 44, owner of Sky Hobbies Singapore, says sales of drones have doubled over the last year. Enthusiast Felix Oking, 33, an administrator of drone hobby group Universal Drones Singapore (UDS), says about 400 people have joined its Facebook group over the last four months. The exhilarating experience of seeing a drone take off and zoom away at your behest with a mere flick of a control stick will fill anyone with childish glee. But it can also be a dangerous operation, especially with bigger, heavier drones like the Phantom 3. Inexperienced fliers who are unfamiliar with the controls risk damaging property or, worse, hurting other people. "Drone flying has evolved. What used to be a toy is now a machine, and we should exercise personal responsibility when we fly (them)," said Republic Polytechnic lecturer Sasidharan Nair, who teaches a course on drone videography. The Civil Aviation Authority of Singapore (CAAS) is the governing body here for the flying of recreational and commercial drones. Users should also be aware of the the Unmanned Aircraft (Public Safety and Security) Bill, which was tabled in Parliament in April and kicked in in June. It lays out the rules for safe and responsible drone-flying in Singapore. Drones are not allowed to fly within 5km of an aerodrome, such as an airport or air base, without a permit from CAAS. They are also not allowed to fly more than 200ft above mean sea level. Operators must apply for permits from the CAAS if they are operating drones that weigh more than 7kg. For hobbyists, this should not be an issue as most recreational drones are lighter than that. Permits are also required for drones used for commercial or specialised services or flying within restricted areas, or if it is used to discharge any substances. Such activitives include surveying or commercial videography, or even for parties where drones may be used to squirt bubbles or water. Users should fly in good visibility and weather conditions, and keep the drone within sight at all times, the CAAS said. Location is another key factor to take note of. It is best to fly in large, open spaces without trees, such as fields in places like Marina South or Old Holland Road. 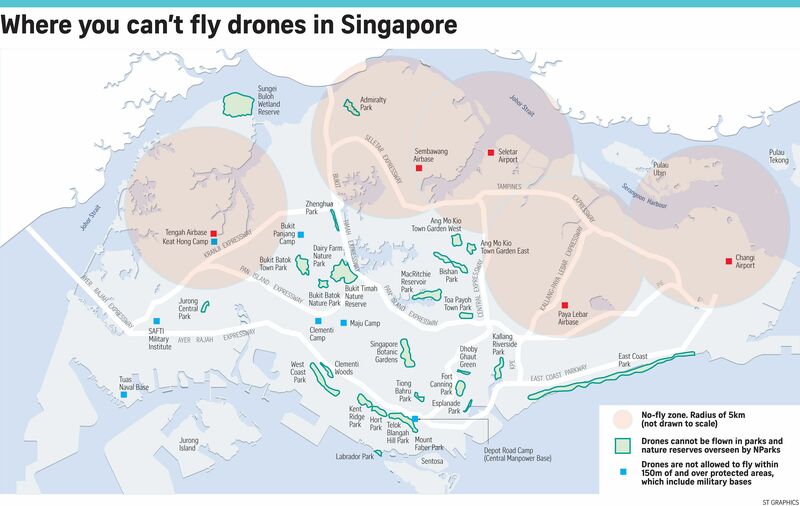 However, under NParks guidelines, drones are not allowed to be flown in the parks and nature reserves the agency oversees, such as the Botanic Gardens and East Coast Park. It might also be wise not to fly drones near high-rise buildings or densely-populated areas, such as within HDB estates. Besides safety concerns, there is also the issue of privacy, as you do not want to inadvertently capture footage of people in a state of undress, for instance. Mr Oking welcomes the rising popularity of the hobby, and encourages more newcomers to attend flymeets so they can talk to experienced fliers. His advice to newbies: "Don't get too excited and fly too high and too fast. Know your machine well, don't get cocky and, of course, have fun."